What is an RPR and Compliance in Edmonton? The question of what an RPR (Real Property Report) is comes up many times because many people don’t understand what it is. 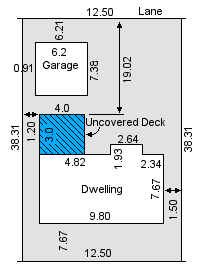 Simply put, it is a land survey of a property illustrating the physical features. Some of the information included on an RPR includes the property legal description and municipal address, property boundaries, adjacent roads or properties, improvements and structures on the property likes decks and fences, right of way, easements and encroachments. It is usually a sellers responsibility to provide an RPR to a buyer. Why should a seller have an RPR? An RPR can protect a seller from future liability. A seller and their real estate agent need to know what they are selling to ensure there are no misrepresentations made. It is suggested that an RPR is obtained early in the sale process so potential problems could be addressed. The city also charges rush fees for compliance, therefore, a seller may potentially save money by having their RPR and compliance well in advance (more on compliance later). In addition, if an RPR is not done on time, there is the possibility that closing could be delayed. Why should a buyer insist on an RPR? A home is likely the largest investment and you need to know what you are buying and whether or not there are any problems with property boundaries. Also, it is nice to have a land survey in the event a buyer wants to do future improvements so the land and structures are clearly outlined. A buyer needs to think long term and one day they may want to sell the property they are buying and this could help avoid complications. How do I get an RPR? Easy! Call a land surveying company and they will come out. Usually, in my experience, there is only a 2-4 day wait. If you don’t know a surveying company, I can recommend a few to you. ASK ME FOR A TIP ON HOW TO POTENTIALLY SAVE MONEY ON AN RPR! The Perfect Home and Falling in Love! Edmonton Real Estate Market Update!